So, OK, this isn't breaking news, but since I have the pics, I'm posting them. 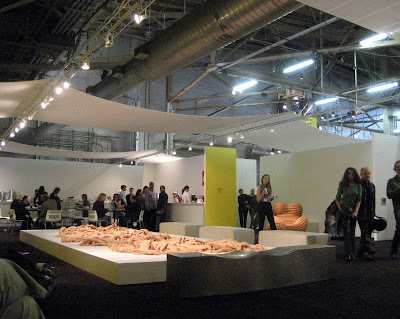 I spent the most time at Pulse and the Armory Shows--hours and hours at each one--so it was great to be able to use my press pass to enter their Inner Sancta, the VIP Rooms. Contrary to common belief, there was no river of champagne flowing, no nubile waiters dispensing caviar, no billionaires dancing in the buff. Maybe that was at the opening. What I saw were a lot of tired fairgoers drinking coffee, yakking on their cellphones or reading the paper. Wait, I was one of them. The windows in Pulse's Collectors' Lounge looked west onto the Hudson, so if you arrived late in the afternoon you got a spectacular view as the sun dropped behind New Jersey. (I returned several times, and when I took the shot below, night had already fallen; it was just before we switched to Daylight Saving Time.) The white leather sofas and armchairs were heaven-- I say this without guilt as a vegetarian--cossetting a fair-tired body until the coffee kicked in. The Armory VIP room had wide chairs and ottomans that you could go to sleep in. And some folks were doing just that. As someone who works at The Armory Show, and thus has access to the VIP lounge, I have to say that its primary attraction for me was the free Illy coffee! Sure, nubile servers offering caviar would be nice, but I could use one of those lattes right now. As someone who gets most of his NY artworld exposure on-line...If Joanne isn't a VIP who is?